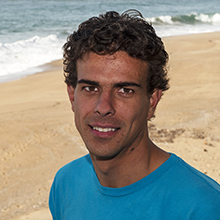 Devon is a Research Assistant in Francisco Chavez’s biological oceanography lab. Devon worked as an undergraduate Research Assistant at Scripps Institute of Oceanography. Devon examined diurnal wind variations through satellite and buoy data. The results of this research were presented at the 2017 International Ocean Vector Winds Science Team Meeting at Scripps. Prior to Scripps, Devon was a Lifeguard for the California State Parks. Devon has a Bachelor’s degree in Physics (and a minor in Earth Science) from the University of California, San Diego.